It was a sparkling afternoon in October I think when we visted Dunkeld again, just for a walk around the place. Perthshire is well known for having lovely trees. Walking around the edge of the cathedral brought us to these sheep that are in the normal sheep stance – head down and chomping away. 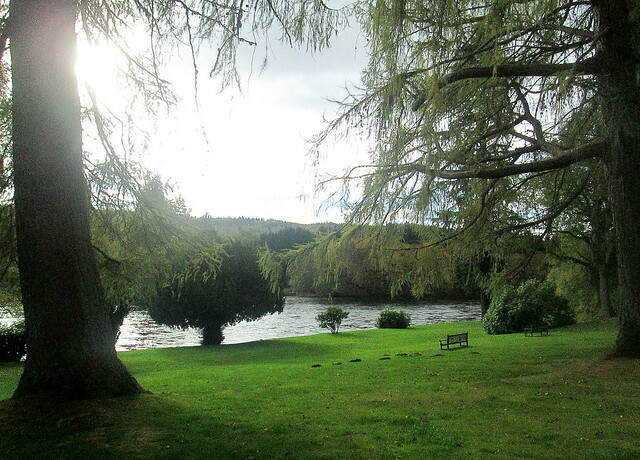 The banks of the River Tay are very close to the remains of the cathedral, so the grass there is manicured compared to the rest of the riverside. It’s a nice place to sit and is just a hop and a skip from the wee town. 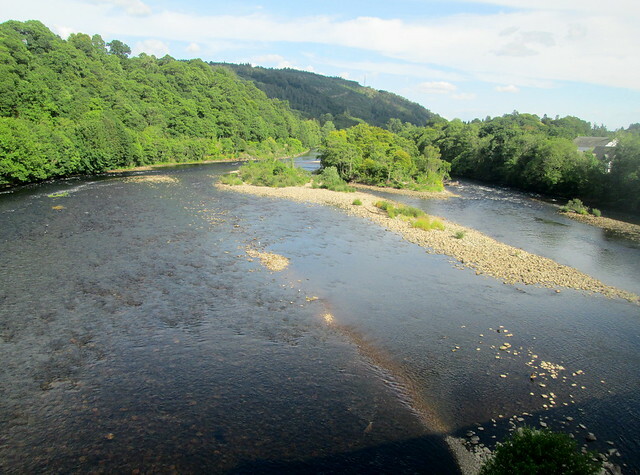 The Tay is really a thing of beauty, swift, clean and somehow honest looking, certainly when I compare it with my recent visit to the River Severn. Don’t fall in though! One of our ‘boys’ once kicked our football into it when he was a youngster, I think he thought we would be able to get it back – no chance. 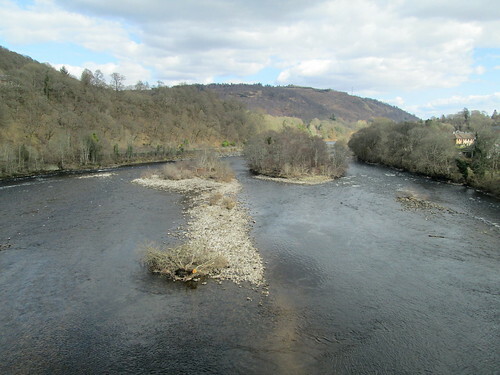 Sometimes they have the salmon season opening ceremony at Dunkeld, they pour some whisky into a quaich which is a two handled Scottish drinking vessel and throw it into the river as a blessing. Nowadays if you catch a salmon you have to put it back in the river, after taking photos of it of course. Conservation is important. One year I remember they had to crack the ice to get a boat onto the river, but I can’t find any videos of that freezing year. 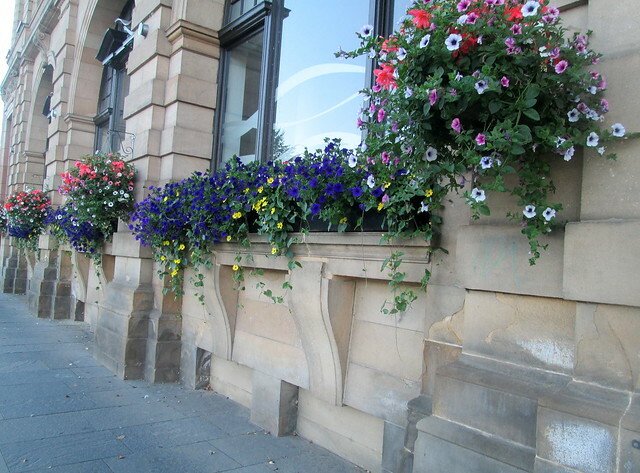 I did find one of the 2018 ceremony at Kenmore though, another wee place I’m fond of and I’ve added it to an old Kenmore blogpost of mine. So if you enjoy listening to a pipeband and you’re interested in seeing a River Tay fishing season opening ceremony have a look here. 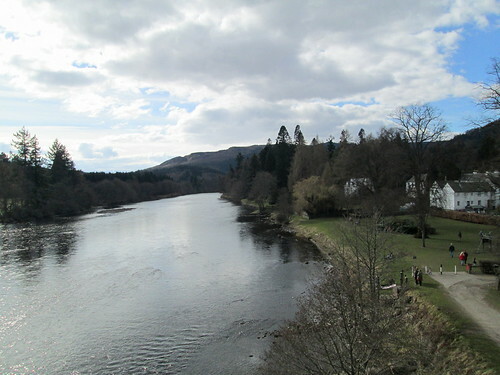 Last Saturday was a gorgeous day, unseasonally warm for early April and we drove up to Dunkeld again. 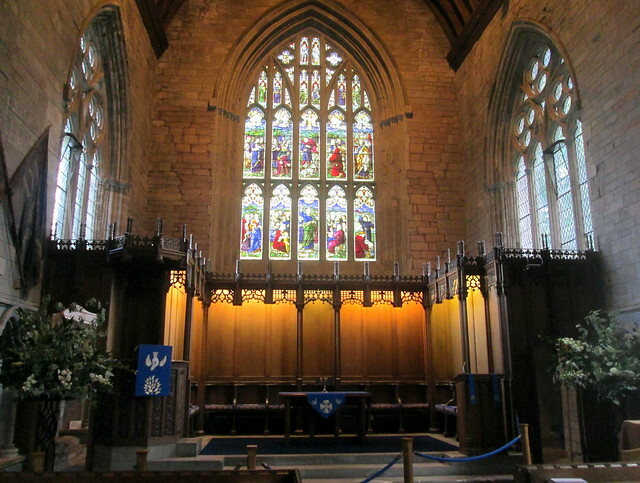 After having lunch at Palmerston’s and having a poke around a wee antiques shop and an unexpected church jumble sale – where I bought a big bag of tapestry wool (when will you use it? said Jack) and some cute wee individual Pyrex dishes, we set off for a walk around the outskirts of the town. 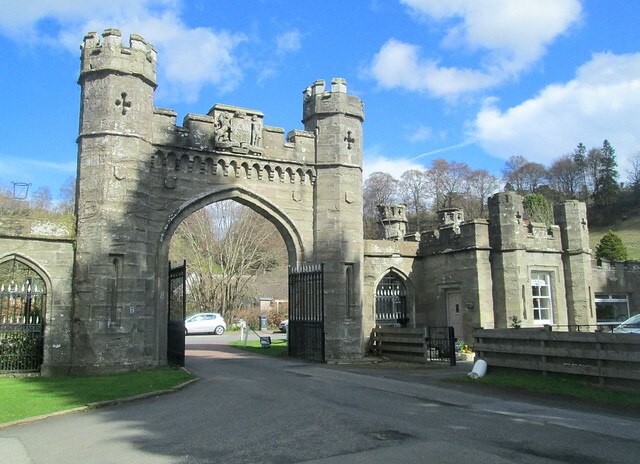 So we walked through the gateway below which is at the beginning of a long driveway leading to a hotel in beautiful surroundings. 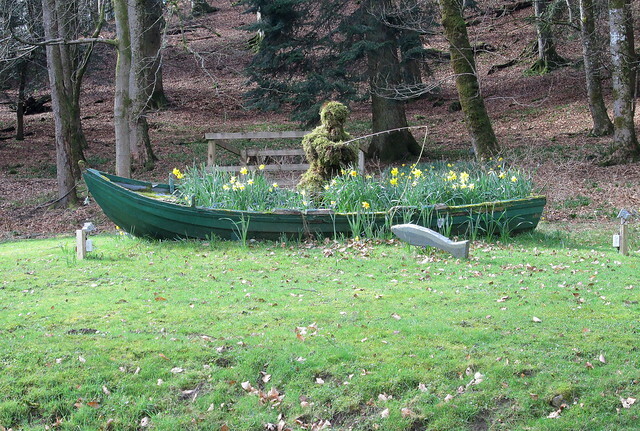 As you near the hotel they have a boat planter full of spring flowers and an ‘angler’ catching a wooden fish. Perthshire or Perth and Kinross as I think the county is called now (why do they have to keep changing names?) 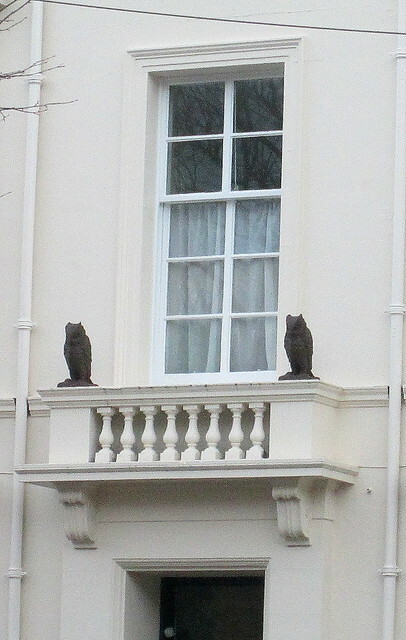 is well known for beautiful trees and some of the ones around here are quite historic. As you can see from the ‘hills’ of earth on the bottom left hand of the photo the moles have been hard at work! As the walk goes uphill towards the end you end up quite high above the River Tay. It looked really placid from a distance but when you are close up it’s really fast flowing. 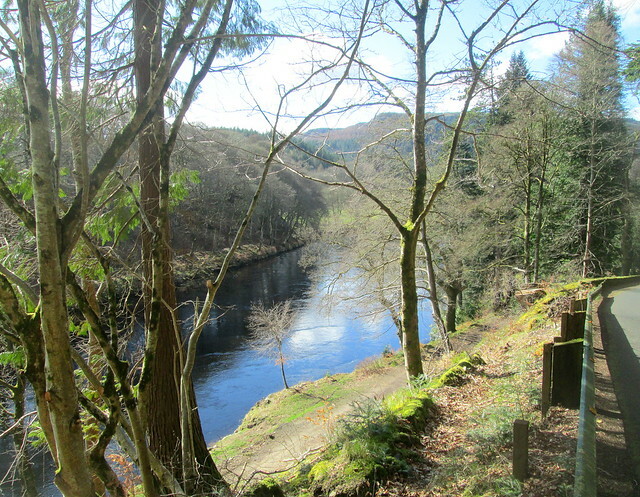 This is a circular walk and it leads you back into the centre of Dunkeld, straight to the cathedral, you can see images of it here. 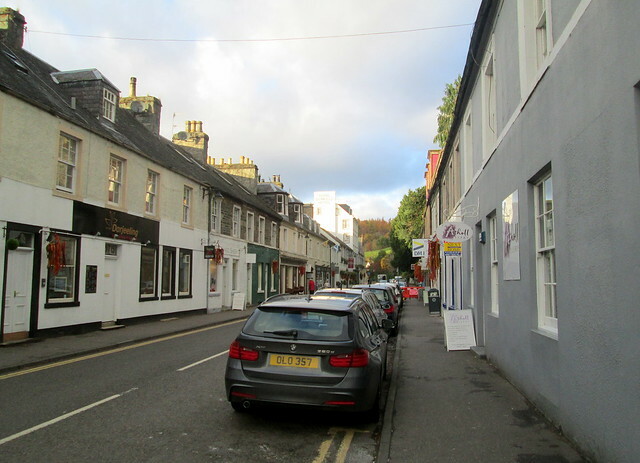 Beatrix Potter visited Dunkeld and the neighbouring village of Birnam every summer with her parents for years and was inspired to write some of her stories here. She also took up the study of fungi and painted beautiful specimens she had collected, unfortunately as a woman she wasn’t taken seriously by the men in charge of such sciences. There is a Beatrix Potter Exhibition and Garden at the Birnam Arts and Conference Centre which displays some of her botanical drawings. Birnam and Dunkeld more or less run into each other but are separated by the river. There’s also the nearby Birnam Oak which is all that is left of the Birnam Wood of Shakespeare’s Macbeth fame, but I’ll save that for another post. 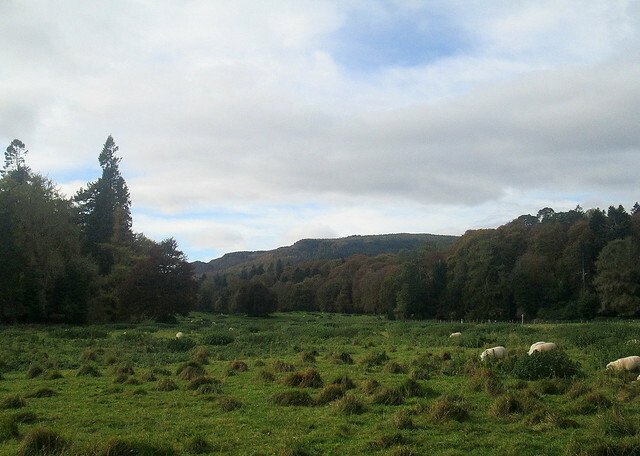 A couple of weeks ago we decided to go to Dunkeld for the day. 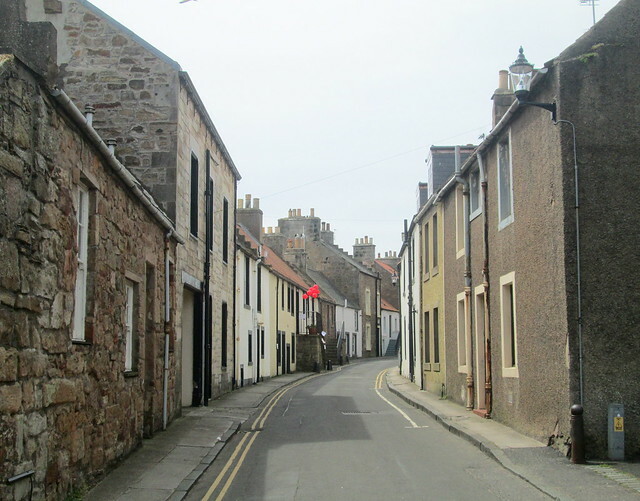 It’s one of my favourite wee towns. It was the day we were in search of autumnal trees. 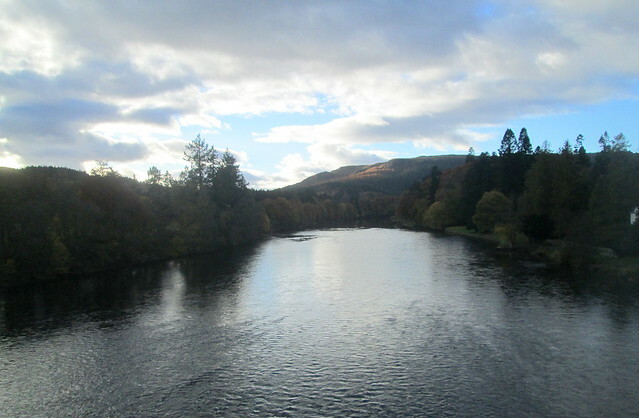 I took the photo below from the bridge in Dunkeld, looking north up the River Tay. I crossed the road to the other side of the bridge to capture the view to the south. 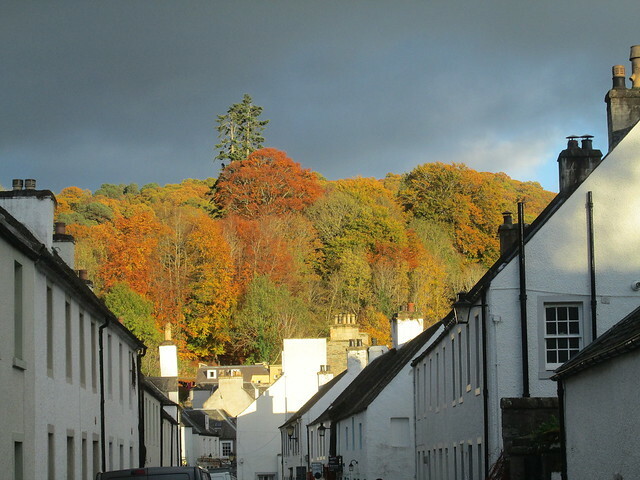 Some houses just off the High Street in Dunkeld. The town was decorated with bunting, it wasn’t long after Halloween but I think it was something to do with a local tradition. If you look closely at the photo below you can just see the beginning of the bridge. Here’s the bridge itself, built by Thomas Telford. 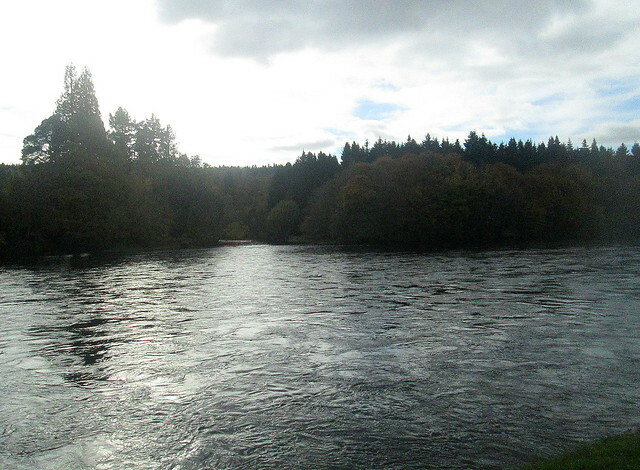 The River Tay is famous for salmon fishing but you have to put them back if you catch any. 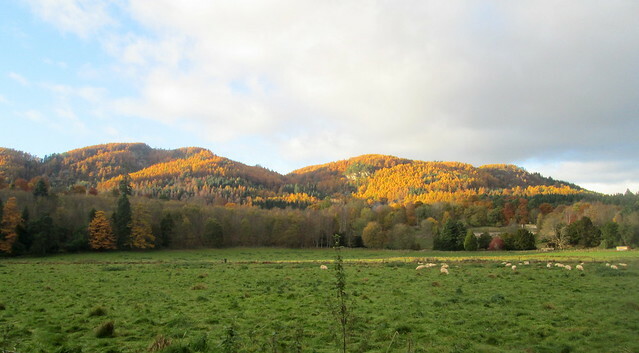 When I woke up on Sunday morning and realised that it was a dead dreich day (in other words – miserably grey, damp day) – I was really glad that we had grabbed a hold of the sunshine of the previous day and gone for a drive up north of Perth to Dunkeld. It’s one of my favourite destinations. 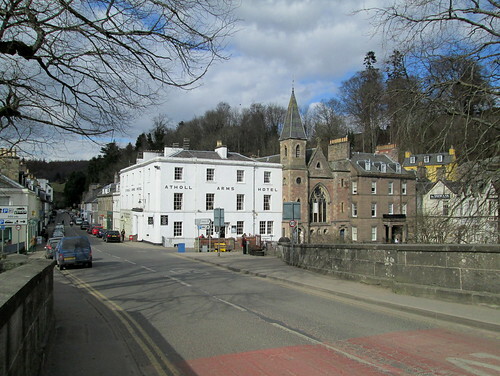 This is a photo of the High Street, taken from the middle of the bridge over the River Tay. There’s not a lot there shop-wise, which suits me fine as I’m happier looking at scenery than ‘stuff’, but we had a wander around the wee town anyway, I decided that I didn’t need a lovely old framed print, so I didn’t buy it and so didn’t help out the country’s economy, but on the other hand – I helped our economy! 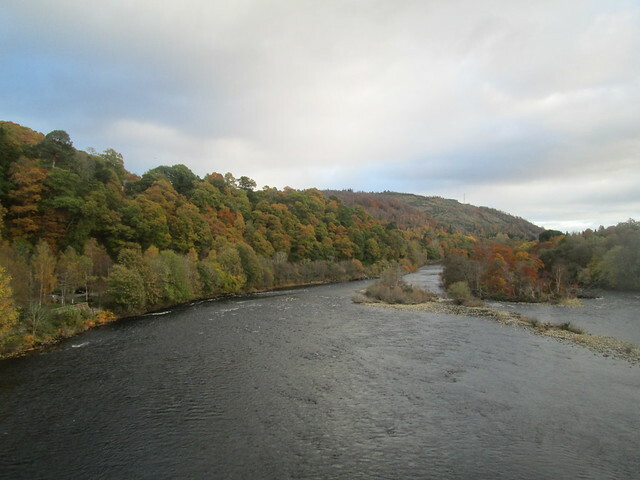 The photo below is of the River Tay, taken from the middle of the bridge again, looking south. As you can see, the trees aren’t even showing a haze of green at the moment, and who could blame them for keeping their tender parts tucked away from the cold wind. 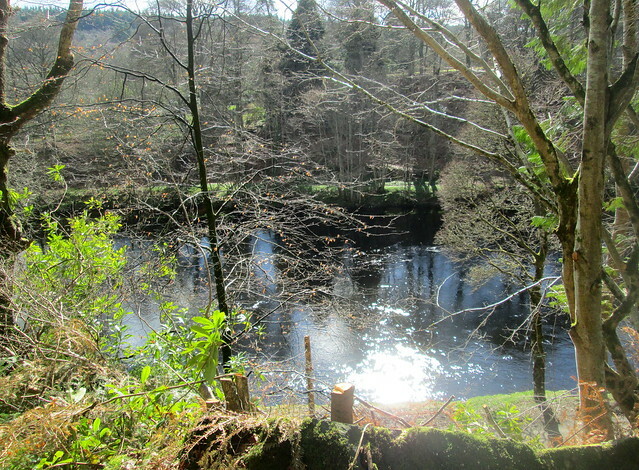 And the photo below is looking along the river towards the north. 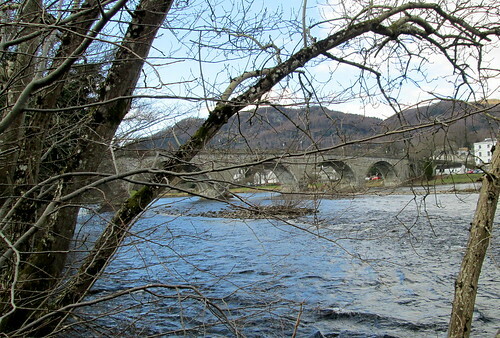 We walked along the riverbank for a wee while and this was the best photo I could get of the bridge through the trees. 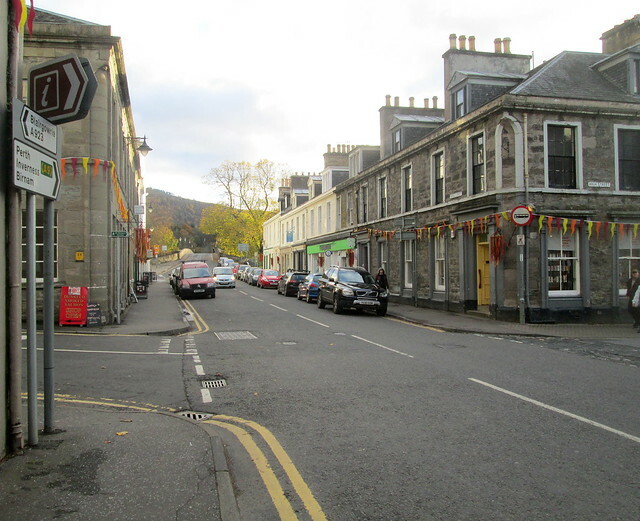 So that was Dunkeld, we climbed a hill to have a look at the war memorial of course, and I thought to myself – maybe Dunkeld would be a nice place to move to. But on the way back to Fife I noticed a roadsign which said Edinburgh 56 miles – and that seems an awful long way from civilisation to me, so it put me right off the idea. The search continues! 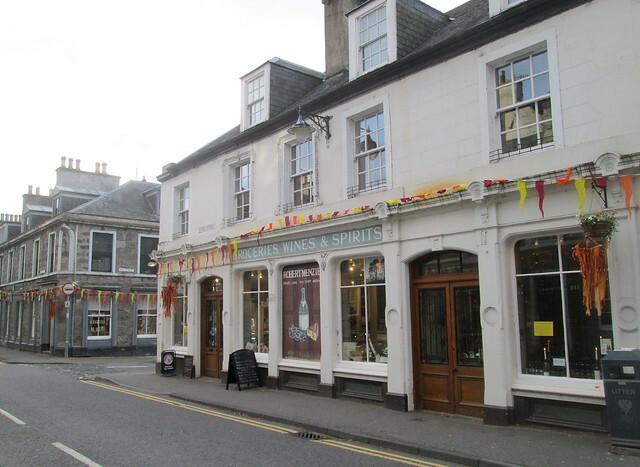 I really like the small town of Dunkeld, there isn’t an awful lot there but all the shops are individual and quirky and the place just has a lovely atmosphere. There is a scenic old bridge which unfortunately is undergoing some work at the moment so half of it is covered with scaffolding, so no photograph at the moment. 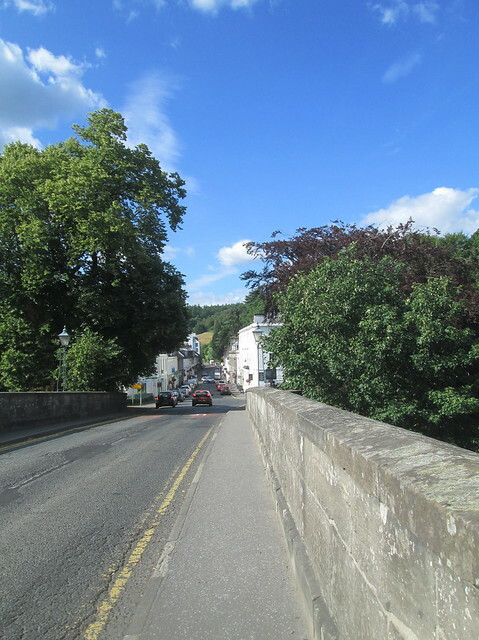 However if you cross the bridge from the town and take the Birnam Walk, which is just down the steps at the left hand side of the bridge, and turn to the right at the bottom of them, after about ten minutes you will reach the Birnam Oak. As you can see, the tree is so old it has been given crutches. 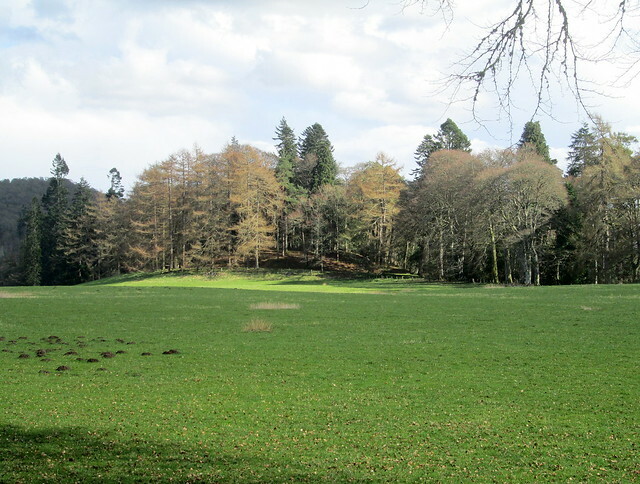 It is thought that this is the only remaining tree of the original ancient Birnam Wood which is mentioned in Macbeth. 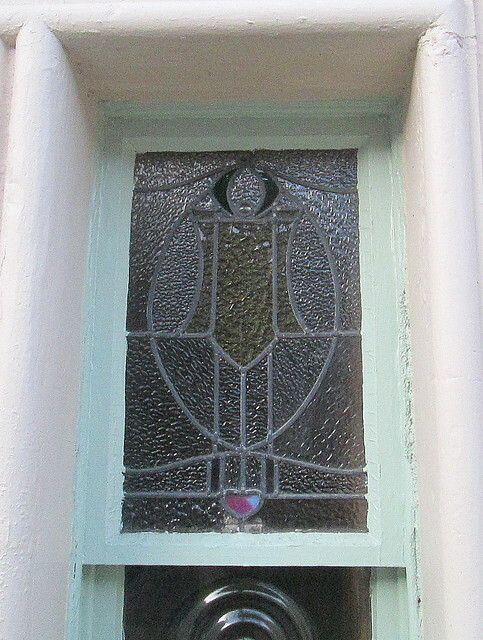 The bottom three metres is hollow. You can see the gap. Apparently a company of English players did act at the nearby city of Perth and it is thought that William Shakespeare may have been one of them. 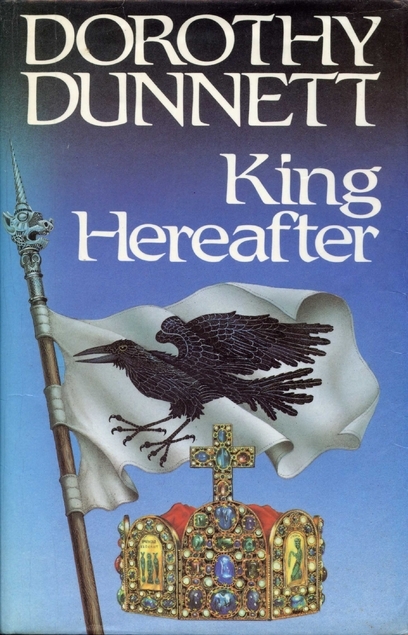 It seems plausible to me as something must have given him the idea of writing about Birnam Wood travelling to Dunsinane. If anything, this sycamore tree looks even older but it is thought to be only about 300 years old. It is wonderfully gnarled, like something out of a scary fairy tale. 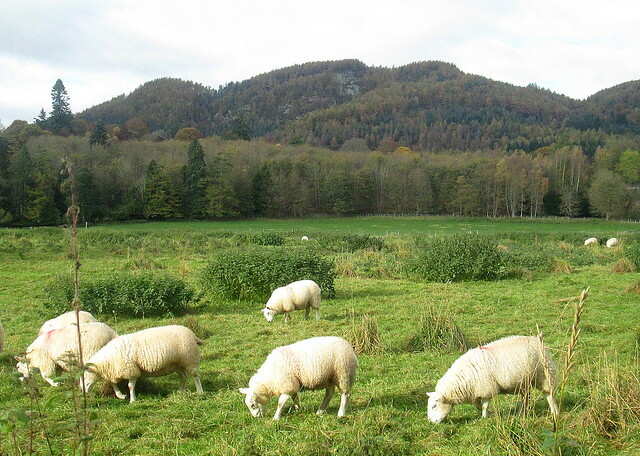 Dunkeld is also famous for its links with Beatrix Potter as her family had a holiday home nearby. She got a lot of her ideas from the area and also did some very good paintings of the local flora and fauna which can be seen at the Arts and Conference Centre in nearby Birnam.